This section includes discussions of trigeminal neuralgia, brain tumors, and head injuries. Trigeminal neuralgia is one of many types of pain that sometimes can be treated by surgery. The disorder, also known as tic douloureux or facial neuralgia , tends to develop in persons between 40 and 60 years of age, causing attacks of acute pain and muscular twitching in the area of the face containing branches of the trigeminal nerve. The painful attacks occur with no apparent reason but seem to be associated with certain stimuli, such as touch or temperature changes, at points around the face and mouth. During periods of attacks, the patient may avoid eating, shaving, or any other activity that might trigger a spasm of severe pain. But the pain attacks also may cease, with or without treatment, for three or four months, only to resume for weeks or months. Alcohol injections and medications may offer relief of symptoms, but when symptoms continue, surgery frequently is recommended. The operation consists of an incision to reach the root of the nerve and cut the divisions that appear to be involved with the painful symptoms. However, cutting the nerve can result in loss of feeling for the entire side of the face, including the cornea of the eye, so that the patient must wear special glasses to protect the cornea. An alternative procedure that is not always effective involves exposing the nerve root and rubbing it, a technique that seems to produce a temporary loss of sensation in the nerve fibers. Brain tumors are popularly associated with neurosurgery skills. And while brain surgery requires great skill and knowledge of brain anatomy, which in itself is quite complicated, most brain tumor operations are conducted safely and successfully. Diagnosing, locating, and identifying a brain tumor are challenges faced by the physician before surgery begins. 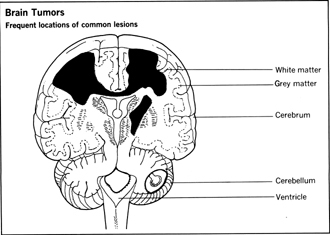 There are a dozen major types of brain tumors plus some minor types. The types of tumors tend to vary according to the age of the patient; the patient's age and the type of tumor may suggest where it develops. Because brain tumors can cause organic mental changes in the patient, the symptoms of changed behavior can be mistaken for neurotic or psychotic disorders, with the result that a patient may spend valuable time receiving psychiatric treatment rather than surgical treatment; autopsies of a significant number of patients who die in mental hospitals reveal the presence of brain tumors. In addition to mental changes, the person suffering from a brain tumor may complain of headaches, experience convulsions, or display signs of neurological function loss, such as abnormal vision. The specific signs and symptoms, along with X-ray studies, electroencephalograms, and other tests, help the physicians determine the site and extent of growth of a brain tumor. A recently developed technique called CT scanning (for computed tomography ) aids the neurosurgeon by producing a series of X-ray pictures of the interior of the skull as if they were “slices” of the brain taken in thicknesses of about two-thirds of an inch. The detailed anatomical portrait of the patient's brain helps pinpoint the disorder and indicate whether it is a tumor or another kind of abnormality. 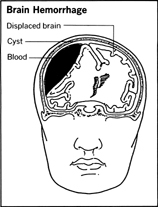 The usual method of removing a brain tumor after it has been diagnosed and located is a procedure called a craniotomy . The entire head is shaved and cleaned to eliminate the possibility that a stray bit of hair might fall into the incision that is made in the scalp. After the scalp has been opened, a series of holes are drilled in a pattern outlining the working area for the surgeon; a wire saw is used to cut the skull between the drilled holes. Removing the tumor is a delicate operation, not only because of the need to avoid damage to healthy brain tissue but because accidental severing of a blood vessel in the brain could produce a critical hemorrhage. The surgeon tries to remove the entire tumor, or as much of the tumor as appears possible without damaging vital brain tissues or blood vessels. All the various types of brain tumors are considered dangerous, whether malignant or benign, because within the rigid confines of the skull there is no opportunity for outward release of pressure. Therefore any growth may compress or destroy vital brain tissues if left untreated. After the tumor is removed, the piece of skull removed at the start of the operation is replaced and the scalp flap is sewed in place. Radiation therapy may be administered for a month to six weeks after surgery to destroy any tumor tissue left behind or tumor cells that may have drifted into the spinal canal. Some tumors near the base of the brain may be treated effectively with radiation alone if the tumor cells are radiosensitive. Tumors of the pineal gland and the pituitary gland also may be treated with radiation. In an alternative procedure, laser neurosurgery , a brain surgeon may use a laser beam to vaporize the tumor. The hair is removed from all or part of the skull; a section of the skull is removed with a power or hand saw after being marked out with tiny holes; and the surgeon then uses the laser to destroy the tumor. Typically, the surgeon may actually control two laser beams: a helium-neon type that guides the surgical work, and a carbon dioxide (CO 2 ) laser that does the vaporizing. Because the “no-touch” CO 2 laser works slowly, an operation may require 10 or more hours. The laser beam can focus on and destroy one tumor cell at a time, targeting areas of tissue 1/50th the thickness of a human hair, or it can attack a number of cells in a group. The surgeon controls the electrical power that activates the beam with a foot pedal. In effect, the laser causes the tumor cells to heat up beyond the boiling point and then to explode into vapor. At the same time, the beam coagulates the tiny blood vessels that it passes through, preventing bleeding. Head injuries, such as a blow to the head, can produce massive hemorrhages within the skull. As in the case of brain tumors, the expanding pool of blood within the skull gradually compresses the brain tissue and can result in death unless the problem is corrected. The damage of a brain hemorrhage can be insidious, with no immediate signs or symptoms of the problem until irreversible changes have occurred in the brain tissue. The patient may receive what may appear to be a minor head injury, for example, and not lose consciousness. Or he may be unconscious for a brief period, then recover and seem very alert. But gradually, over a period of hours or even days, neurological signs of disintegrating brain function appear. The treatment requires a procedure similar to that used for removing brain tumors. An opening is made in the skull to remove the blood or blood clot and relieve pressure upon the brain tissues. The chances for full recovery depend somewhat upon the extent of brain damage caused by the hemorrhage before treatment. Surgical treatment for a skull fracture may combine techniques of various other methods for fractures and brain injuries. The scalp is shaved and cleaned carefully so the surgeon can determine the extent of the injury and its location with respect to vital tissues under the skull. With the help of X rays and signs of neurological damage, the surgeon frequently can tell how severe the fracture may be and whether there is bleeding beneath the skull. If the skull appears to be intact but there are signs of a brain hemorrhage, the skull is opened to remove the blood or blood clot and relieve pressure on the brain. If the skull fracture is compound and depressed, or with skull fragments in the brain tissue, efforts also must be made to elevate the depressed bone section so it does not press on vital brain areas and to remove bits of bone or other foreign materials that may have entered the brain. Surgeons frequently can rebuild a fractured skull by replacing missing bits of bone or adding appropriate synthetic materials such as a piece of metal plate. Full recovery depends upon such factors as the age of the patient and the severity of damage before treatment was started. Younger patients generally respond better to the repair procedures, but full recovery from a severe skull fracture may take as long as a year. Aneurysms can develop in blood vessels of the brain, and like aneurysms in other parts of the body they can be corrected surgically. A ruptured aneurysm produces a brain hemorrhage. The condition is most likely to develop in people over the age of 30; in patients over 40, women are more likely than men to be victims of the disorder. The approach to repair of an intracranial aneurysm depends upon the condition of the patient and the location and size of the aneurysm, which frequently can be identified by X-ray pictures after an opaque dye has been injected into the bloodstream. The diseased blood vessel may be ligated, reinforced, or repaired, depending upon the conditions found by the surgeon after the aneurysm has been exposed and examined.